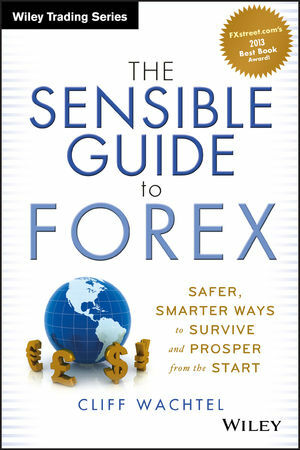 Strategic lessons for investors in stock indexes, forex and other global markets, both technical and fundamental outlooks, lessons about what’s really moving markets now and what we need to watch in the future. Don’t be fooled by the prevailing calm. –TECHNICAL OUTLOOK: Bullish for global stocks and other risk assets as upward momentum improves and psychologically important overhead resistance beckons for a test higher. –FUNDAMENTAL OUTLOOK: The key supports of the multi-year rally remain in place, now augmented by new ECB stimulus and the promise of more coming. –CONCLUSIONS: A quiet economic calendar but many important lessons and potential market movers worth watching. — BIGGEST LESSONS: An EU version of QE, QEU, is coming. Many ramifications for all investors. Here’s your chance for fame-name that EU QE. See below for details, prizes. 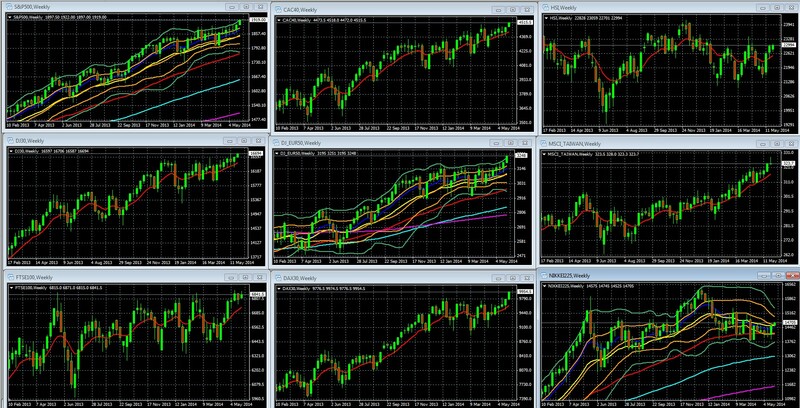 Moving averages from 10-200 weeks continue trending higher. 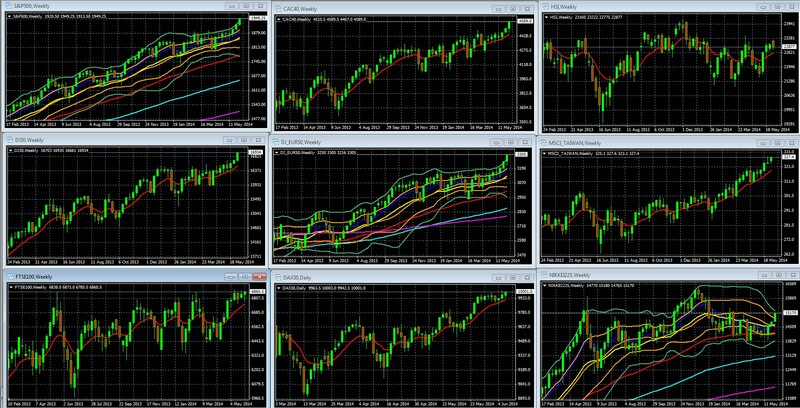 Asian index trends continue to be too diverse for easy generalizations. There’s only one important point from the daily charts that doesn’t show up on the weeklies. US and European indexes made all of their gains on Thursday and Friday following the ECB announcement. Without that the week would have been flat. The ECB saved the week and kept momentum on the daily charts firmly positive, with the indexes bouncing off the bottom of their double Bollinger® band buy zones, and ending the week at the upper edge of these zones. This matters because the coming week’s calendar is relatively light, and unlikely to provide any departures from the current themes. The combination of technical and fundamental evidence suggests that stock indexes and most other risk assets continue drifting higher. Here’s why. All major central banks remain in de-facto easing mode, even if some claim they’re finished and even moving to tighten, no one is planning to materially tighten for about a year at least. In addition to the above, we’ve got new ECB stimulus, with more coming. The overall theme from weekly economic data from the US, Japan, EU and China continue to reflect their same themes through which stocks have continued to rise. We’ve slow recovery in the US and Japan, stagnation in the EU (ex-Germany), and some slowdown in China, to the extent we can trust Chinese data at all (more on that below). Even if the calendar’s events aren’t stellar, they’re not stopping the rally either. Medium and short term momentum in the weekly and daily charts, and now If that’s not enough, we’ve another technical factor likely to make itself felt in the coming 1-2 weeks – call it the “round number syndrome.” Simply put, the S&P 500 closed at 1949.44, about 50 points, a 2.5% gain, short of 2000. The DJIA is needs only about a 0.5% gain to hit 17,000. Big round numbers are psychologically important in their own right as support and resistance. When markets get close to them traders tend to test them. Everyone knows this, and that fact alone creates a self-fulfilling prophecy. 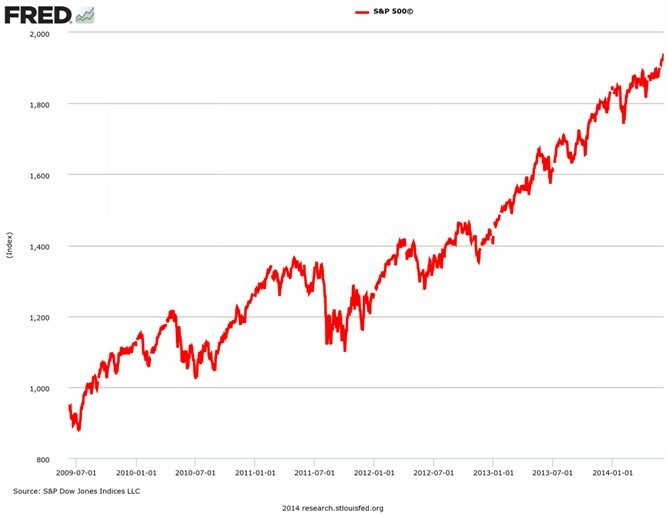 Chart trends are generally believed to simply reflect underlying fundamentals. Here however, we’ve a classic case of when nearby major support or resistance directly influences trader expectations and so creates its own fundamental, supply and demand reality. In sum, US and European indexes are likely to be flat to higher this time next week, and at least test those highs if the coming week’s data is even mildly supportive. Last week’s only real market mover was the ECB stimulus announcement. Uncertainty ahead of it suppressed price action. Relief that it met expectations and promised more cheap cash to support the bull market in risk assets, was what drove them higher. This will be a market mover in the months ahead, the question is how and when. Low rates provide general support for EU markets. More stimulus is coming: The ECB is already engaged in expanding the money supply and outright debt monetization, is exploring new ways to do this, and appears to be ready to for a full “out of the closet” QE program. Germany acquiesces to it: Germans may not be cheering, but their silence alone is significant. A year ago anything less than unconditional opposition would have been unthinkable. A combination of the inevitability of the need for outright money printing, plus evidence that deflation is now the more immediate threat for Germany, seems to have convinced the normally inflation-phobic Germans reluctantly accept inflation risks for now. Rallies On Bad News? : A big question is whether or not really bad data will be seen as bullish because it advances the odds of more stimulus coming sooner, which is the EU’s best hope for higher asset prices. EU Data Now More Important: The ECB may be done for the coming months, but some kind of EU variant, call it “QEU” for now, is coming (got a better idea for name? See our offer below) . Meanwhile the Fed policy is more set for now, (for reasons we discussed in some depth here) and thus less responsive to monthly data. That means markets will be paying much more attention to EU growth, jobs and inflation data. Don’t be surprised if we start to see indexes and other risk asset markets up on bad EU data and down on good data (if we get any outside of Germany) as QE anticipation starts causing “bad news is good news/good news is bad news” reactions, just as we saw in the US in times of speculation over new QE. See our special report for further details. US Data, Even Jobs Reports, Losing Relevance? The Fed is responding to anything besides longer term trends, so even top tier monthly data needs to really surprise in order to move market perceptions about Fed policy and thus move markets. Friday’s report was in line with expectations, reinforcing the already entrenched slow but steady growth theme. Indeed, the only risk with US data may be that it provides too much upside surprise and gets markets worried about an accelerated Fed tightening. This is our reality. Not surprisingly then, US data, even the once climactic monthly US jobs reports on which QE speculation once depended, were irrelevant this week, and may well take a back seat to EU data in the near future. The recent strength in US data (like last week’s monthly jobs and manufacturing reports) support the argument that earlier weakness was indeed due to harsh winter weather. After the ECB stimulus program, the only big theme was market complacency, also referred to as lack of volatility. Central banks dominate markets more than ever as they control the stimulus drip to which markets have become addicted. With the exception of last week’s new ECB stimulus, policies of the largest central banks are holding steady. 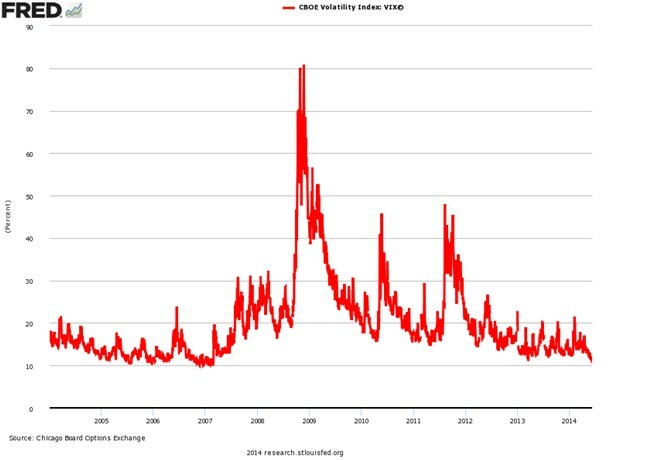 The only useful other lesson here are that low volatility and complacency mean insurance against volatility, aka trend reversals, (selloffs for stocks, for example) is now cheap. Thus it’s a good idea for to insure long stock positions with some low cost SPY puts, etc. A Great Summary From Morgan Stanley: Why Worry? In one sentence, this is our market: risk on, very low interest rates for the foreseeable future, and almost no volatility to speak of anywhere. That was the succinct summary from Morgan Stanley’s latest Global Strategy Outlook. 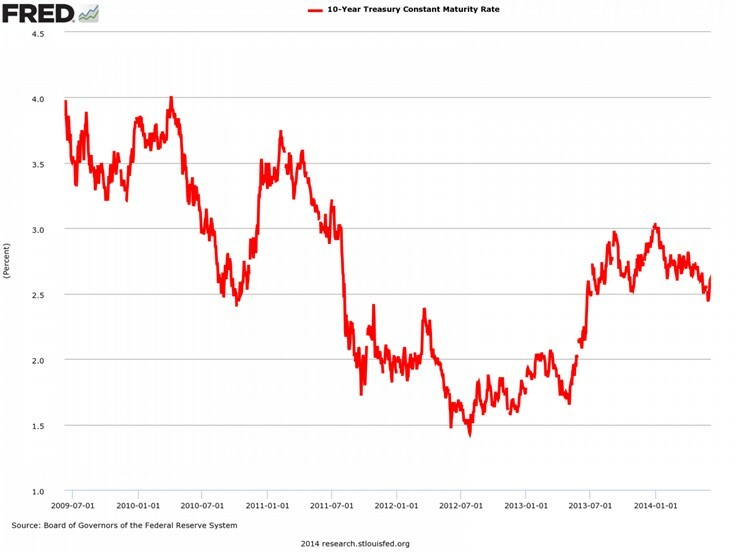 In sum, interest rates are unsustainably low, so bond yields will spike when investors believe the Fed thinks that the economy is solidifying and/or inflation is a threat, and the Fed will hike rates at that point, which is currently believed to be no earlier than mid-2015, and very possibly later, for reasons we discussed in depth last week here. Fighting continues as Ukraine battles Russian forces comprised of a local separatists and discreetly placed units of Russian military personnel (uniformed and plain clothes) providing a mixture of firepower and advisory support, including cyber-warfare experts, per a Financial Times report last week. Meanwhile, Russian oil giant Rosneft (US: OCRNL, ROSN:MICEX) signed a new energy deal with Azerbajian last Tuesday, and of course, no sign of meaningful sanctions coming. Official Chinese Data Is Uniquely Unreliable And At Times Manipulated: Sometimes the most revealing insights lie in the disagreement between the official and unofficial reports… suggesting that official data is useful only to the extent that we think about it as state-sanctioned propaganda. In other words, it tells us what Chinese policymakers want the world to believe. China Growth Fueled Mostly By Fixed Asset Investment, Not Exports: While China is still the world’s largest manufacturer, its growth is more from fixed asset investment fueled by unsustainably high debt, which in turn is based on high levels of domestic savings on which banks pay minimal interest. Savers subsidize the borrowing. Government and government-sponsored borrowers in uncompetitive industries consume the majority of the country’s credit: This means that households and SMEs (small and medium sized private enterprises) must borrow through shadow banks at massive risk premiums. Lack of access to cheap credit and low returns on savings hampers China’s transition to a consumption driven economy, because households and SME disposable income is essentially transferred to the state companies and those sponsored by them. However weaning these firms off of cheap credit risks a greater slowdown that could spark an economic crisis, including capital flight and exploding debt bubbles with massive waves of defaults. To prevent spooking markets, Chinese officials need to keep the zombie state companies going and minimize divergences between official and real Chinese economic data. China growth is definitely slowing but not collapsing. The scariest tidbit from above is that in our interconnected global economy, we don’t really know about the state of our largest growth engine. That leaves disturbingly high potential for markets to wake up one day and find they’ve massively underestimated risk and overpriced assets (aka a global market selloff or crash). The above is in line with what we’ve been reading in recent years. Key conclusion: exercise extreme caution if investing in Chinese or related assets (that includes many Australian and other commodity investments, which are essentially proxy investments in China growth. It’s a relatively light economic calendar, topped by US retail sales and little other really top tier reports. Monday: Nothing likely to materially influence the EURUSD. We have Swiss, French, German bank holidays. Forex brokers open but lower liquidity that can make for very low volatility, but occasionally very dramatic volatility if sudden major surprises. US: JOLTS job openings, said to be an important metric now for the Fed, however US jobs announcements have lost some of their importance because the Fed’s policy is believed to be set for now. For reasons we discussed two weeks ago in our special report 2014’s Biggest New Investment Theme: Lower US Rates For A Much Longer Time, fed policy is believed to be fixed in dovish mode for the foreseeable future unless there are major changes in the current “slow but steady” US recovery story, be they bullish or bearish. Thus market sentiment on Fed policy direction is no longer influenced by any one month’s labor statistics, as it was back when fed policy was seen as more fluid and influenced by each month’s jobs data. Monthly jobs reports will only again become more influential again when they appear to be forming a new trend, be it bearish (implying more dovish fed policy) or bullish (suggesting faster tightening and rate increases). Wednesday: Nothing likely to materially influence the EURUSD. Here’s your chance for fame. We’re all going to need a name for the coming ECB QE to distinguish it from that of the Fed, which already owns plain old QE. Here are a few examples to inspire you. You get the idea. First prize is a copy of my award winning book. Second prize is a copy of the same, but you must agree to read it. ← The Coming Week’s Top Market Movers: The Biggest Event of 2014 This Week?